The most common cause for alarm in the medical field pertaining to waste disposal is the exposure of the worker to infectious wastes and contraction of diseases from these wastes. With the increased risk of exposure to blood borne pathogens in handling body fluids and disposal of items that have been tainted by these fluids, awareness and education for the prevention of percutaneous wounds is the highest priority. Landfill burial of free liquids on absorbents or biodegradable items that release the liquids under the pressure of the increased garbage levels are prohibited in most of the countries. Untreated items that are not incinerated, steam sterilized, or chemically treated for disinfection still have biological activity that can continue unchecked. A low-cost alternative to existent medical waste disposal methods that meets these treatment standards and does not draw upon high energy costs is cementatious solidification. Solidification processes are used for various hazardous waste disposal of items that cannot be recycled or disposed of in an effective manner, such as incineration. By physical and chemical treatment of medical wastes by solidification, the waste is fixated and stabilized in a cement matrix that will not allow release of the fluids under pressure. Cementatious solidification incorporates a range of materials such as gypsum, lime, and Portland cement to form slurry that will fixate medical wastes. In most cases, the cement mixture is added directly over the container holding the wastes, although direct mixture of the cement and wastes do occur. As the setting process occurs, the outside oxygen supply and raising of the pH cause the biological activity to cease. 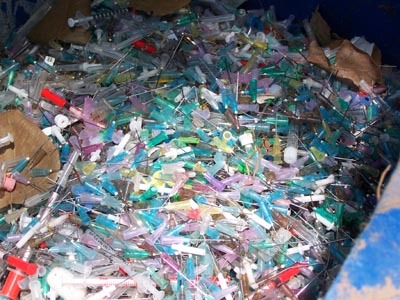 In most medical wastes, disposal of needles is most commonplace. Having direct contact with people that have had injections or blood drawn, they would be the most likely item to need treatment. A number of devices are available to incinerate the needles; however, many facilities use a common needle disposal container prior to its being disposed of via a waste management company. These containers can still pose a threat to the worker handling the items, as the needles are still in a free state. In addition, with the containers holding sharps such as razors, glass, dental devices, and surgical retractors, open exposure to infectious elements still exists. A person can conceivably still run the risk of being cut via handling these items. Cement stabilization is the solution to these preventable incidents. Double-bagged “red bag” wastes commonly refer to wastes treated with some form of sterilization. However, the bags still do not prevent the possibility of the worker being injured and exposed in handling the items in transfer. Solidification of these wastes on-site provides the added benefit of safety and increased stabilization of the residue. 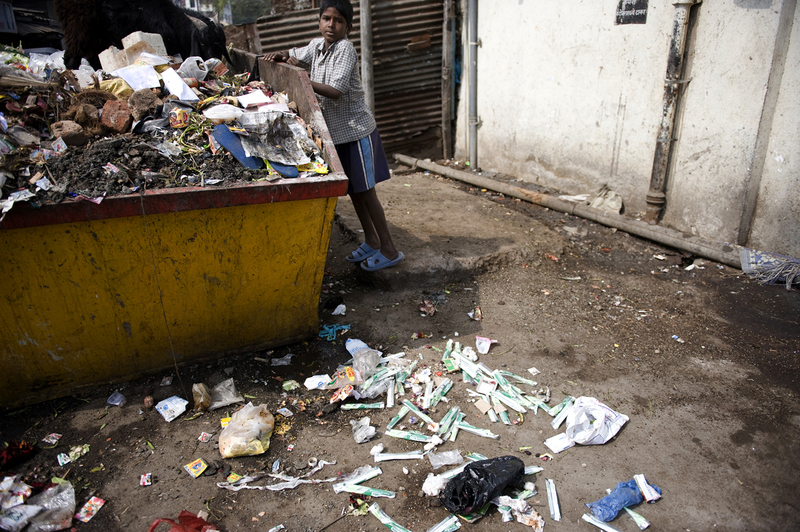 A child separates medical waste in a dumpster in Karvenagar Slum, Pune, India. With hundreds and thousands of needle sticks a year occurring in the healthcare marketplace, the risk of exposure and injury is an alarming certainty. Treatment of medical sharps should be given utmost priority, and it begins at the source of its generation. On-site treatment of the wastes will provide a safe passing down for the handlers of the materials until its final destination. The solidified mass within the container gives this security to the handler, as its structural strength provides safety and security. The Center for Disease Control and Prevention (CDC) recommends institution of preventive measures for work-related infections and use of proper disposal equipment in handling needles and infectious wastes. Cement solidification gives additional support to this emphasis on safety. With proper identification of treated biomedical materials in this manner, exposure and disposal risks are significantly reduced. Meeting the conditions of local, state, federal and international regulations for waste disposal will determine final costs and definition of the materials. Guidelines vary pertaining to designation of what is and is not considered biomedical wastes; however, there is universal acknowledgment that the dangers of exposure should not go unnoticed.